It was the late 1980’s strolling through a New Jersey mall, when we came across a “Fazzino” for the first time. Drawn in immediately, I remember the artwork put a smile on my face and brought happiness to my day, it was whimsical and fun. However, it wasn’t until many years later when our second son, Gabriel, came along that we were able to stroll through the mall and make a purchase. 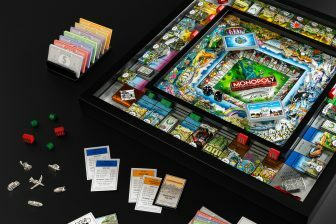 Having recently returned from a trip to Disneyworld, Mickeywood was our first Fazzino. 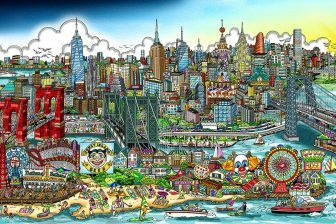 Charles Fazzino quickly became our artist of choice and his pop art was filling our walls. 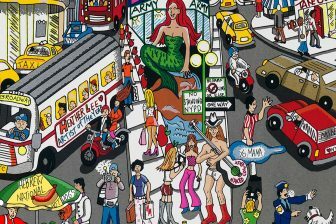 In 1999, when Gabriel was eight years old, he created his own Fazzino with the help of his art teacher. Quite proud, Gabriel took his piece to show Mr. Fazzino at the local Wentworth Gallery. Graciously, Charles signed and dated the back of Gabe’s picture and it still hangs in his room today. Little did anyone know that ten years later, in 2009, Gabe would sit down in front of Mr. Fazzino at the Wentworth Gallery in Short Hills and extend a hand of thanks for being such a huge influence in his life. You see, Gabriel is heading off to college in 2010 to major in Fine Arts! 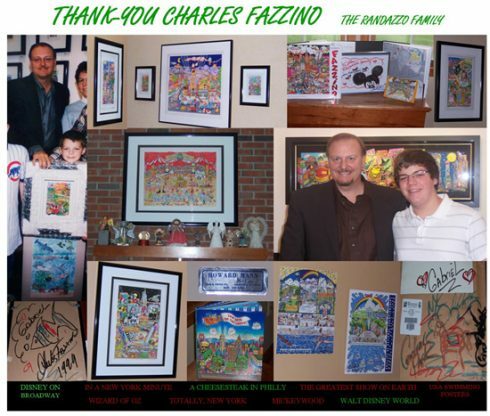 We hope you enjoy our collage of “Fazzino Fun” that lives within our home and is shared by all that come to visit.